There are movies and then there are honest to good movies that are just so cheesy that you fall in love with them. 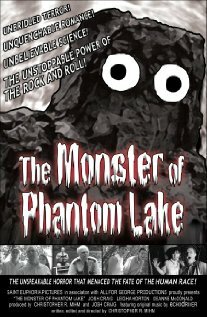 The Monster of Phantom Lake (2006) is the fist film made by my friend, Christopher R. Mihm in Minnesota. He makes some of the coolest movies on the planet and Monster is one that will get you hooked. Mihm deliberately makes his movies to look like, feel like, act like, and sound like the old 1950s style drive in movies from tester-year. Replete with corny acting, inuendos and bad special effects, Mihm’s genius is he knows exactly how to draw the viewer in. Storyline: A faithful “re-imagining” of 1950’s Cold War era, B-grade, drive-in horror movies, The Monster of Phantom Lake follows proud scientist Professor Jackson, his graduate student, and five swell teenagers as they discover the terrifying effects of “Atomic Waste” in the form of a horribly mutated “shell-shocked” World War II soldier / lake-algae monster. What is there not to love about a film like this?